Ever since I saw the film ‘The Motor Cycle Diaries‘ I have been dreaming about travelling around the world. It is the story of young Che Guevera and his friend travelling across Latin America on a motor cycle. That movie influenced me very much, imagine just wandering around the world with your best friend! But for that, you need preparations, have to set up a vague plan, find out about the places that you intend to visit, the time estimates (especially if you have a job)…. Leaving all these to a tour package kills the thrills for me. Last year (Sep 2013) I travelled to Rishikesh, Haridwar, Mussorie and Devprayag with my cousin. The view of the Himalayan peaks in the distance that I had that day is still fresh in my mind. Due to the heavy floods which had hit Uttarakhand a few months before that, the roads to Badrinath ,Kedarnath and Gangotri were under construction. Also my limited time constraints made the Himalayan trip impossible. But I knew that was not the last time I was going there. I was planning a trip to Badrinath ever since that. One day I came to know about the Gangotri Gaumukh trekking. I learned more about this trekking using this forum. Many members here were kind enough to provide answers for my questions. Without their help it would have been very difficult for me to prepare. Now let me say a few words about my travel companion, his name is Sudhin (Sasikuttan! ), one of my best friends from college. We were roommates for four years in our college hostel. Currently he is working offshore in Dubai. We planned this trip according to his vacation. And finally after collecting all the necessary information and things we needed, we started our journey on October 11 2014 Saturday morning. We planned to reach Delhi by flight so Cochin airport was our first destination. The departure time was 6.15 am, my friend Alfred drove me to airport in his Deo. Sudhin was already there at the airport and we boarded the flight. It was my first airplane experience, so I was really excited. We reached Delhi around 11 am (After travelling in almost all types of transport modes I would say there is nothing better than an Indian railway journey through Konkan in monsoon). We took a bus to the Aerocity metro station and boarded the Airport Metro express to New Delhi station. The metro terminates there and we had to change the line. We took the yellow metro line to Kashmiri gate station which is located just two stations from New Delhi. We had a delicious lunch at a small food corner there, we ordered two varieties of paneer curries and it was for the first time Sudhin was having north Indian food. Kashmiri gate has an Inter State Bus Terminal where we can catch buses to almost all the neighboring states of Delhi. Around 1.30 we boarded the bus to Haridwar. The journey took 6 hrs with a short stop for refreshments. So around 8 pm we arrived at Haridwar and checked into a room just opposite the Railway station. We took a walk to Har ki pauri (shores of Ganga). On the way we had the famous hot milk and jilebi! But I was little disappointed as we approached Har ki pauri because the Ganga’s water level was too low unlike the last time I saw, when it was flowing like mad. We had dinner from a nearby hotel and went back to the room to sleep. Early next morning we woke up and got ready for the long Journey awaiting us .We had to reach Gangotri which is 300 km from Haridwar, by night Since there aren’t any straight buses to Gangotri from Haridwar, we were to go to Uttarkashi first and then take another bus to Gangotri. So we took a bus to Uttarkashi via Rishikesh around 5.30 am. We reached Chamba around 9 am where the bus stopped for quick refreshment for the passengers and driver. From there we saw the snow covered tops of theHimalayan peaks from the distance for the first time in our journey. The tallest mountain ranges in the world, the natural barrier of our great nation was shining so bright in the sunlight. But disappointingly that was the last time we saw that magnificent view till we reached Gangotri. The driver of the bus rushed through the narrow road which snaked across the valley. Soon after crossing Chamba you will get a companion up to the destination, it is none other than the mighty 'Ganga'. But at that point its name is Bhagirathi, the river which came to the earth from the heavens because of the prayers of King Bhagirath! It becomes Ganga after joining with Alakanandha at Devprayag which is not quite far from Chamba. Bhagirathi looked like a lake in those areas because of the Tehri dam which is constructed across the river at New Tehri, I thought. But as we passed a few kilometers we could see the real face of Bhagirathi. She is very thin but flowing really fast, cutting the mountains into two parts. One of the things that astonished me was that there are countless numbers of small streams joining Bhagirathi from its source in Gaumukh but still I felt the water level of the river is the same as its beginning. May be it is because she flows very fast! There are huge rocks in the river that got there probably because of landslides. After 8 hours of journey we reached Uttarkashi and had lunch there. Shortly after that we headed for Gangotri in a shared jeep. Even though heavy trucks could go through those roads there was no regular bus service from Uttarkashi to Gangotri, shared jeeps are the only source of public transport. The condition of the road is very bad at some places even though most of it is fine. There are a few small towns on the way. We could feel the chillness in the atmosphere as we approached Gangotri. At last around 7 o clock after 12 hrs of tiring journey we finally reached Gangotri. We took a room there and headed for dinner. First we had tea at a nearby tea shop which was owned by the guy who also owned the lodge. There we met Jayveer who is working as a guide for Gangotri - Gaumukh trekking. We agreed to hire him for our trekking and he accompanied us for the next two days. Gaumukh is an ice glacier under the ‘Bhagirathi’ and 'Siva ling' mountains which is the source of the Ganga. To reach there you have to walk 18kms from the Gangotri town through the Gangotri National Park, and for that you need to get permission from the national forest authority. We initially thought of getting permit the next morning but Jayveer said that it’s better to get permit then itself so that we could start our trekking early in the morning. So went to the forest office. Even though it was closed by that time, we got the office opened and got permit using Jayveer’s influence! You have to provide the Id proof of all the members who want to travel and also the details of your guide or porters if any, accompanying you. By the time we left the office it was past 8 o clock so almost all the shops were closed except for a few hotels, so it was a little bit dark around there on the way back to the lodge. I was leading the line when I heard a voice from behind 'Aliyaaa just look above you', I looked back and it was Sudhin. He was looking up at the sky, astonished. I looked above and it was one of the most astonishing views that I have ever seen in my life! There were millions of shining stars above us in the sky and all look much closer than we see them usually. I guess it is because of the altitude of Gangotri which is located 3500 meters above sea level and also because of the less light pollution. There was a better view of that starry sky the very next day so I am not describing it now. We had dinner on the way back from forest office. Then we went back to the lodge to get some sleep, promising Jayveer bhayya to meet him at 6 o clock in the morning to start our trekking. We lay down on our bed thinking about what tomorrow was going to be like! The 6 o clock assembly was just a false promise. How could we get up early in the morning in that shivering cold weather? Somehow we managed to get up at 7 o clock. There was no water heater in our room. We decided to skip the brushing so just imagine the coldness of the water there ! We went down to the tea shop where we had agreed to meet Jayveer (Of course we didn’t take a bath! )We had a quick breakfast and also got our lunch packed (stuffed parathas). 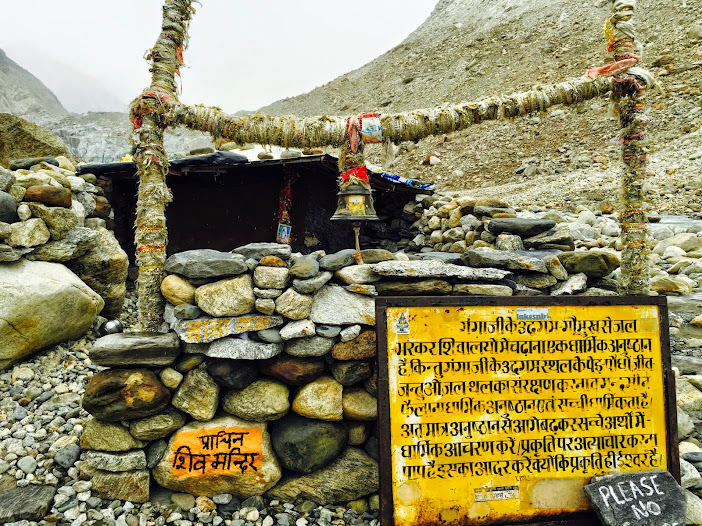 Initially we thought about going only to Gaumukh but then decided to go to Tapovan (5 kms away from Gaumukh) which would take the total days of trekking to 3. Before beginning our trekking we visited the famous Gangotri temple. This temple along with Yamunotri, Kedarnath and Badrinath is known as the 'chota char dam'. These are well known Hindu pilgrim centers. In day light we saw Gangotri town much more clearly. The town is surrounded by three big mountains, but their top wasn’t covered with snow unlike the ones we saw from Chamba. There is a small bridge connecting the opposite side of the Ganga, we walked across it. We came back to Gangotri temple and started our trekking. There is a check post after just 2 kms, where you have to show the permit to enter further. There they write the date and time of your crossing. For each person including the guide we had to give 150 Rs as deposit per day. The rest of the amount was to be collected when we got back there. After walking some more distance we saw the Gangotri town from a distance. We continued with our journey. The path was steep at some parts but most of the way there was just a gradual increase in height. But the sides were so steep that even one slip could lead to a fall from a great height and probably a holy dip in the Ganges! We made the huge mistake of carrying all the way, heavy bags which contained two pairs of dresses and blankets which weren't needed at all. Because of this heavy luggage we had to halt at so many places to take rest. We ate chocolates and drank water to gain energy. As we headed further we could see the giant Bhagirathi mountains from a distance… it was a remarkable view. We had to reach near those mountains by the end of the day. That’s an awful lot of distance to cover, I thought. We passed many people coming from Gaumukh, most of the them foreigners. This trekking route is one of the ancient routes in the world where civilized men travelled through thousands of years before. Its beauty is surreal, the accessibility for us Indians is very easy since it is in our country. Yet the fact that very few Indians visit here compared to the foreigners disappointed me. The foreigners hire porters to carry their luggage. Some of them travel all the way to Badrinath from Gangotri which could take up to 10 days. May be next time I thought. The trekking continued. I had walked 7 km at night for second show movies after bunking hostel during my college days, but this was different. My shoulders began to ache because of the baggage, and my heart was beating fast. We drank a lot of water on the way. There was no shortage of resource to replenish once the bottle was finished. There were plenty of small water falls coming down the mountains on the way. The water was so pure and cold. It was a sunny day, even though a cold breeze blew throughout the day. We used sun block to avoid sun burn. After 9 kms, we reached a check post. After lunch there, we resumed our journey. Soon after, we passed through some areas where there was a high chance of landslides to occur. Jayveer told us to walk fast. As we went a little bit further we saw a few fellow natives but they weren’t people. They were goats which live in those mountains. Some of them just looked relaxed and was monitoring our journey from the top of a rock! The change of geography was very clear as we walked further. The vegetation that we saw in the banks of Ganga earlier was becoming less and less and it was rubbles everywhere. After 14 km we finally reached the place called Bojwasa - our pit stop for the day. Bojwasa is the base camp for the trekkers en route to Gaumukh. At Bhojbasa there is an Ashram called ‘Lal Baba Ashram’ for travellers to stay, and also a government lodge and a police station. Jayveer arranged a room for us in the Ashram. There were a lot of foreigners staying there. We got into our room to put all our things there and went to the cafeteria to have tea. The rate at the ashram is Rs 300 per person for a day which includes food. We had lunch (again) there (rice and dal curry). Just after finishing lunch we immediately went back to the room to take rest. We were so exhausted and I had a severe head ache also. Around 6 clock we woke up and went outside. It was getting dark as the sun was already behind the tall mountains. At the ashram dinner was served at 6.30pm. All of us who stayed in the ashram assembled there and had dinner. Some of the foreigners were struggling to have food without spoon and knife. But the most difficult part was to wash hands in the ice cold water after dinner. We met two Malayalees there, in their mid-thirties. We talked to them for some time and then went outside. We looked up at the sky, this time the view was much more spectacular. Millions of stars were shining in the dark sky in different colours. But the most astonishing thing was not the normal stars but the arrangement of stars that were grouped in a certain pattern as a thick line which split the entire sky, known as the 'Milky Way'. Milky Way is the galaxy (group of stars) in which our solar system is included. We could clearly see the bright white light of the Milky Way in the sky. I always wonder how our ancestors wrote and studied about Milky Way when there weren’t any telescope in the ancient times. Now I know the answer. The light pollution back home is clearly hiding the sight of this spectacular natural phenomenon. We lay down there for a few more minutes for a little space exploration. I remembered how long ago on my 8th birthday my dad gave me a book about the space exploration and stars named “Manathunokkumbol” . That day we lay down in the farm at night as he told me about the ‘Orion belt’ and a few other star groups. I tried to find the Orion belt but it was in vain. Those three stars which shine so bright and easily identifiable back home are now along with the other countless shining stars in the sky! But we managed to observe a few satellites orbiting around the earth. Before starting our trip we had gone through the weather forecast of Gangotri and found there was a chance of rain for one day. As we prepared to sleep I asked Jayveer about it and he said at Bhojbasa there wouldn’t be any rain. We lay down thinking about the next day’s adventure. The sound of Bhagirathi flowing nearby was the only sound that we could hear at that time. I hadn’t recovered from the shoulder pain completely even the next day when we woke up. Sudhin was also feeling ill, he had breathing trouble because of the cold. Yesterday on the way to Gaumukh we had decided to go to Tapovan (which is 5 kms far from Gaumukh) if possible. The route to Tapovan is very tough compared to Gaumukh. You have to walk over the ice glacier for some distance and a guide is a must. At Tapovan there lives a Baba named 'Mauni Baba' who hasn’t talked for 7 years. I have seen a few documentaries about him in Discovery and National Geographic channels. When the winter season starts all the people in Gangotri and Bojwasa leave the place, come down from the mountains and live in the outskirts because of the deadly cold weather but the baba lives in Tapovan throughout the year. I told Sudhin about this guy and even though Tapovan trekking wasn’t in our plan he agreed to go there. After a brief discussion about it inside the room we finally went outside to have tea. We stood still for a few seconds witnessing the sight in front of us. The weather had changed completely .It was dark clouds everywhere, and we felt that a big storm was on the way. 'I told you there won’t be rain here in Bhojbasa but I didn’t say there won’t be a snowfall' Jayveer said .Oh yah very clever! He said we had to start trekking as early as we could if we wanted to go to Tapovan and Gaumukh, so we wasted no time. It was around 7 o clock when we headed for Gaumukh just after having a cup of tea. The route to Gaumukh from Bojwasa which is 4 kms far is quite easy comparatively. There was no vegetation at all on our way, it was just rocks and pebbles. We saw the huge ice glacier from the distance. Finally we reached Gaumukh around 9 o clock. To our disappointment the Bhagirathi and Siva Ling peaks weren’t visible at all due to the cloudy sky. But the view of Gaumukh ice glacier was breathtaking. There it was…..‘Ganga’ the holiest river in India which flows through thousands of miles, serving half a billion of people and countless number of animals, originates from that huge ice glacier. One wonders how this small stream could make such a huge impact on India’s history. Here the water is in its purest form and the goddess is the river itself! It melts from the pure ice glacier untouched by humans or animals. Here I am. After countless nights of dreaming and preparations I have finally made it. I remembered a story from Mahabharata in which Arjuna had gone for a one year journey throughout India, he had started his journey from here! Even if it was just a story the man who wrote that had to visit this place for sure. It could be here that our ancestors wrote the Upanishad thousands of years before, which meant the name 'Nachikethas' had evolved in some one’s brain here millenniums before! There was a small Siva temple near the Gaumukh, its top decorated with beautifully coloured prayer flags. The Gaumukh ice glacier was hardly 250 meters from where we stood. We were so eager to go closer to it. But suddenly a small breeze started and there we witnessed the first snowfall in our life! 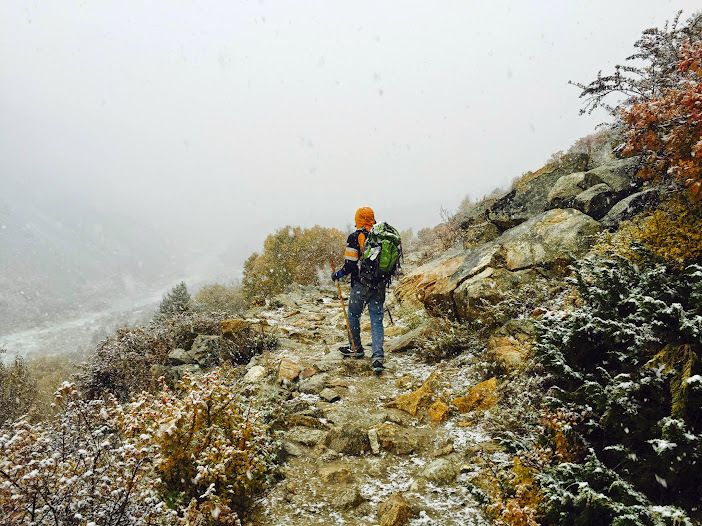 It started so slowly that we were eager to catch the tiny snow in our hands. The sky became cloudier even than the morning which made the Bhagirathi and Siva ling mountains totally invisible. We were thinking of capturing closer shots of those mountains yesterday, which by that time was next to impossible. To add more disappointment to that, Jayveer said that it could be really difficult for Tapovan trekking since the snowfall could be heavier in those areas , so we might as well skip that. He even prohibited us from going closer to the glacier since it was really dangerous. He also wanted us to return to Bhojbasa if we were to return to Gangotri that day. In this weather staying at Bhojbasa for one more day would be of no use if we could not do the Tapovan trekking. The cold weather was bearable for me at that time since it had only started so I intended to stay there a little more time. We captured a few more snaps there and took a bottle of Ganga’s water. My fingers were almost snow bitten by the cold water of Ganga. The temperature of the water could be closer to its melting point for sure! At that time a few travellers that we had met at our ashram last day reached Gaumukh and said they were heading for Tapovan. When we said we were skipping it because of the weather, one guy said they were continuing with the Tapovan trekking because 'Zindagi na milegi dubara'! (You Only Live Once). I didn’t want to leave that magnificent place so soon but we had to. It took another 1 and a half hour to return to Bhojbasa. We had breakfast just after reaching Bhojbasa from the GNVM tourist home and also packed our lunch. I thought the snowfall would be over soon but when we went outside it was still falling. By 11 o’ clock we started our 14 kms return trip to Gangotri. On the way we met a lot of trekkers coming to Bhojbasa. Jayveer told us to walk fast because there might be chances of landslides in some areas due to the snowfall. We spent only two days there but had the chance to experience two extreme weather conditions! The disappointment about not going to Tapovan and the cloudy skies which prevented us from enjoying the magnificent view of Siva Ling Mountain was getting lesser as I walked through the snowfall. I always wanted to experience a snowfall and now my dream was being fulfilled….. I cannot describe how we felt when we walked across that beautiful valley. The sight of Ganges flowing through the mountains which were covered in white thick snow was absolutely breathtaking. At that time the colorful vegetation that we saw yesterday was fully covered with thick snow. Slowly we started to feel the real difficulties of that cold weather. Since we were climbing down we didn’t need as much energy as we needed for yesterday’s trekking but still we by force had to take a few minutes of rest at regular intervals. But the moment we stopped, our body temperature would drop very much. Even though I was wearing gloves my hands were aching very badly. Initially we took a lot of videos and walked slowly admiring the beauty of the mighty Himalayas but as time passed our only thought was about getting back to Gangotri as fast as we could. On the way we saw a few guys coming from Bhojbasa, carried by donkeys .They were none other than the guys we met at Gangotri who were going to Tapovan.What happened was that they went half way up to Tapovan but their legs got snow bitten because of the heavy snowfall which made three feet height of snow.So they decided to end their journey. 'Zindagi na milega dubara' right! At one point we stopped to have lunch but I couldn’t stay there even for a few minutes, so skipped it and started walking again. Sudhin accompanied me but Jayveer said he would catch up. That man had walked countless times through this way in different weather climates, this was nothing new for him. I walked as fast as I could but it seemed we weren’t getting any nearer! To be honest I was close to tears at the end of it. Finally we reached the check post that we had crossed yesterday. Soon after we passed it, I saw the Gangotri town in the distance. I felt as if I had seen an oasis after days of travel through the snow desert! When we finally reached there I laughed like a marathon runner who had just reached the end point. At Gangotri it wasn’t snowing but raining. Up in the sky we could see the snow falling but by the time it reached the ground it melted. Jayveer told us to change our wet dress so that we would feel better. But I couldn’t even bend my fingers to unbutton my shirt- they were snow bitten! I somehow managed to change but there was absolutely no energy left in us to go outside and have some tea. Out of sympathy Jayveer bought us soups. We had the soup and took some rest, it was 5 pm in the clock. We could tolerate the hot weather but there was no way to escape this cold weather, I thought while lying down. At night we went outside to have dinner, it took us 10 minutes to walk 1oo meters. The power was gone in the whole town, it was so dark out there and the mesmerizing view of the starry sky was missing. It took me hours to go into deep sleep. Next morning we woke up and went outside. It was really sunny as if yesterday hadn’t happened at all! How mysterious are the ways of the Nature!!!!. I thought about the power of our technologies which correctly predicts the weather 2 weeks prior. The power hadn’t yet come. Our phones were off. I was so eager to upload the pictures in What’sapp and Facebook. In a way we all travel to upload the pics online, don’t we? I looked towards the mountains near the town, all of them were covered with snow. We had breakfast and said goodbye to Jayveer. It took some while to get a jeep from Gangotri since most of them were pre- booked by the tourists. The whole day we travelled and finally after 9 pm we reached Haridwar. We were thinking of going to Mussorie earlier if we got a day extra but then decided to avoid any place with cold weather. We had had enough of it at the Himalayas. The next plan was to go to Agra and visit the Taj Mahal. We immediately got in to a bus to Delhi from Haridwar after realizing there was no train at that time. Reaching Delhi early in the morning we took a room near New Delhi railway station. In the morning we went to Agra to see one of the most beautiful buildings on the planet, the ‘Taj Mahal’. I felt like Taj Mahal is more beautiful from a distance than when we see it closer. We didn’t get enough time to visit Fatehpur Sikri so decided to go back to Delhi. The next day after checking out from the hotel room, we went to Chandini Chawk in Metro. We did a little shopping there and also visited the Red Fort which is nearby. Personally I find the Red Fort more interesting than Taj Mahal since there are lots of places to walk inside it. We went to my Kunjammavan’s home in Gurgaon for the night. The following day we left Delhi to come back to Cochin by train. At the station we bought two novels - one of them was the ‘The Alchemist’. I had heard so much about the book and finally had a chance to read it. It was really a good coincidence….. reading a book which inspires us to travel a lot while travelling. The hero in the book is made to travel for a treasure which is actually buried in his native place only. But he later realizes how travelling around the world has changed his life for good. Most of the incidents in the story could relate to our life very easily. There is one moment where a merchant dreams all his life about going to Mecca. When the hero asks the merchant about it he says if he achieves that dream he will not have anything left in his life to live for. I had dreamed about this trip for many months. After I finally achieved it, I thought ‘now what?’ I think in our life we need many dreams to keep us alive, not just one. Travelling is one of the most enjoyable and beautiful things in our life. It is the perfect way to understand our world and life. By reading this travelogue I hope somebody who hasn’t travelled much, will get inspired and do it soon. On 20th Oct 2014 we reached back in Kochi after an adventurous and memorable trip .I need to find another dream as soon as possible, I thought, as we left the railway station. Thank you very much for your report trip:thumbup: Very nice written :):) and beautiful pictures. Thank you also for Sudhin. Are you aware of the recent updates about Kedartaal trek which has to done through Gangotri-Bhojkharak-Kedarkharak. No I am not aware of this trekking. where can i find more about it? I would like to do it next time. Kedartaal can be reached from Gangotri-Bhojkharak-Kedarkhar-Kedartaal. Kedartaal is a nice trek. Should take three days to get there. If you decide to do it in less time, you need to be acclimatised. Once you are there you can do day walks. I once spent six weeks in the area while climbing Brigupanth. It is a magical place with snow covered mountains reflecting in the lake. What permit is required and from where I can obtain it for gaumukh ? For Gaumukh you need to get the Gangotri national park permit which can be obtained from Gangotri and Uttarkashi (not sure though). It comes around 200 Rs I think. for sure bro, believe me your post a really helpful.